It's been a looooong time since I've posted. My medicines have kicked in and I'm feeling much much better! I had trouble with a medication that was prescribed to make the tingling/burning sensations a whole lot better. It had to be approved by Medicare to reduce the cost from $225 down to $60. They had me as LL Bien and the Rx was Linda Bien. After about a month and a lot of patience and stick-to-it-ness by my doctor's office, WE FINALLY got it approved. I'm feeling so much better. I had a check up last Friday and, since starting back on my diabetes diet and paying attention to my medications, I've lot a total of 61 pounds!!! I'm so proud of myself and am looking and feeling much better. I have, of course, had to get some new clothes which is a good thing!! I have made a few cards during this time and am now taking time to post them. This first one was a "just because" type of mood I was in along with wanting to use this plaid paper. The images are from Whipper Snapper and I used my Copics to color. It's a simple card, but ideal for jotting off a quick note. I made this card for a friend who was in the hospital. I really enjoy using this Decorative Bird Set from Hero Arts. The decorative paper is from Paper Trey's Men of Life Collection. I like the look of the cross stitch pattern and combined it with the Close to Cocoa from SU. The dots that fill in the scalloped edge is Scribbles 3-D paint in coordinating colors. 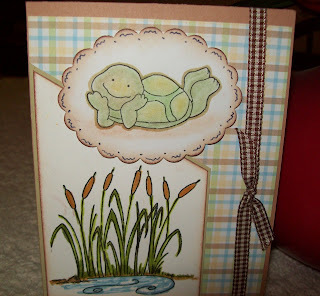 This last card was one that I dreamed up wanting to use this quilted pattern paper. I don't think it shows up on the picture, but all of the lines have been scored and Scribbles 3-D paint was used at each intersection to "anchor" the quilting. 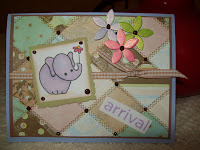 I love this little baby elephant, "Ellie" from Stampendous. The flowers are the table confetti by Gartner that I picked up some time ago at Michaels' Bridal Secttion. I then colored them with coordinating colored markers from SU as the markers seem to work better than Copics on this this type application. Well, that's all for now -- have to go attend to my laundry. I've washed and folded three loads so far. Have about two to go. I don't mind laundry. I did my dreaded job yesterday ... ran and EMPTIED the dishwasher!! I don't know why I hate that job so much .. I think I'd rather do anything other than empty the dishwasher. I generally just run it and get the clean dishes out as I need them; however, I generally leave the dishwasher door down (which is stupid) and I have visions of tripping over the open door when I go back into the kitchen. I'll talk to everyone again REAL soon!!! 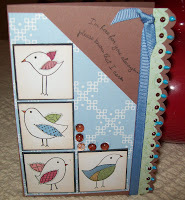 as I plan on making a few cards this afternoon. My inspiration and "mojo" is slowly returning.